How to get super into spring? Bake lavender banana bread this weekend. Ha! I’ve just been SO excited about it. It’s incredible how my taste for florals has grown, however I still must make it clear that I really only love them when they are combined with sugar. Like I don’t want anything rosewater-flavored unless it has a bit of sweetness. You know? I’ve said it a billion times and I’ll say it again: when lavender is combined with sugar + vanilla, I just think it smells and tastes like the inside of an ice cream parlor. Or “shoppe.” Saying shoppe with the ‘e’ is most important. But really, it smells and tastes like combination of creamy vanilla ice cream and freshly made waffle cones. Which is so, so good. I definitely have an affinity for that scent because in high school, I worked at Bruster’s and came home with burnt finger tips from the waffle iron and ice cream dreams every night. My clothes would literally smell like ice cream an waffle cones and let me tell you… that is not a bad problem to have. Lavender banana bread. I’m very into it. So much into it that I drizzle a glaze over top and even tinted it a lavender shade. I call it light purple. Max swears that it’s pink. Hey, whatever. It tastes so good! It probably came to me because I couldn’t stop thinking about this banana bread with espresso glaze. Freaking love that loaf. I’ve always stood by the fact that banana bread is a snack that tastes like cake, but since it’s a bread, it’s acceptable to eat for breakfast. Essentially you’re eating cake for breakfast. This one might not make the breakfast cut. Is it delicious enough? Um, of course! But with the icing on top it really is more like a snack or dessert, sooo… maybe I’ll cave and keep it for an after dinner treat. Or the afternoon snack that is necessary for everyone’s sanity. P.S. 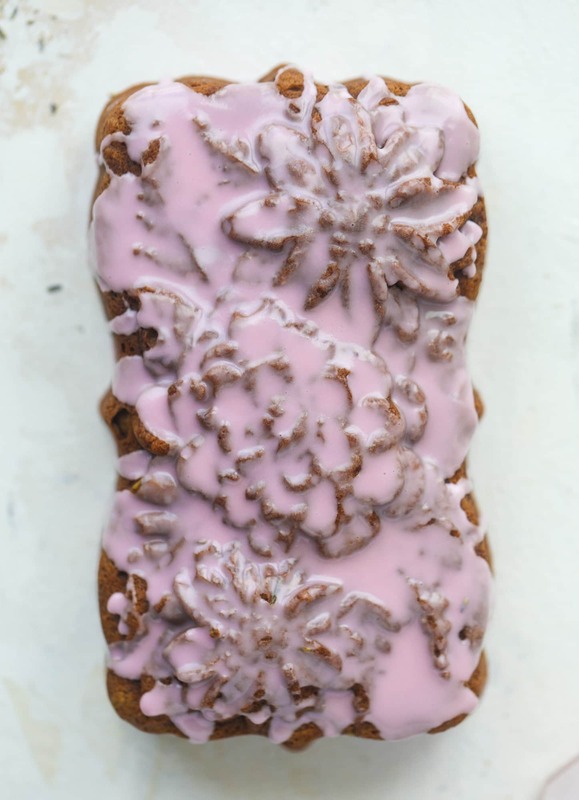 this floral loaf pan is from Nordic ware and I love it. It’s actually a 6 cup pan, while most are a little larger, so keep that in mind if you grab it and want to make your favorite bread recipe. It’s so pretty though, right? Really gets me over the moon for spring. Since I used this smaller loaf pan, I went with this recipe in order to make sure it would all fit! I add the lavender in and BOY was it good. This time around, I also used lavender extract. I’ve used it before and tend to have it on hand, but most other lavender recipes I’ve shared require you to infuse cream or syrup or something with dried culinary lavender. I love that, but this is way easier! I suggest getting the culinary lavender and the extract from amazon an then you’ll have them on hand for all the lavender goodness I want to bring you. Eddie doesn’t really care for banana bread (I know! how?!) and even he liked it. Max was also super into it. Emilia lives to eat so of course we shared slices like there was no tomorrow. It’s a must make! This lavender banana bread is a fresh, modern spring spin on the classic! The light flavor of lavender gives this banana bread a whimsical twist. Preheat the oven to 350 degrees F. Spray a 6-cup loaf pan with nonstick baking spray. In a large bowl whisk together the melted butter and sugar. Whisk in the eggs, vanilla extract and lavender extract. Whisk in the mashed bananas. Stir the dry ingredients in the wet ingredients until just combined. Do not over mix! Pour the batter into the greased loaf pan. Bake for 55 to 60 minutes, until the top is golden and set and a tested inserted in the center comes back clean. Let the bread cool in the pan for 15 minutes, then carefully invert it and place the bread on a sheet of parchment paper. To make the lavender glaze, whisk all ingredients together until smooth. If it seems to thick, add in more milk 1 teaspoon at a time. If desired, you can add a drop of food coloring to make it pink! Optional: sprinkle a teaspoon of culinary lavender over top of the glaze. Now I can officially say it’s spring! Can you use culinary lavender instead of extract? How would you substitute it? Looks nice. I have culinary dried lavender as well. I’ve never seen or heard of lavender extract. I love lavender in cakes and desserts – such a great unique flavor. This banana bread looks delicious! I’m with Max, it’s pink, haha! Such a lovely idea for Easter! Just spraying the pan and it unmolded well? Those intricate nordic ware pans can be a pain sometimes. yes! as long as you use the spray that’s specifically for baking (it has a little flour in it! ), it works super well with nordicware! I was intrigued by this recipe so had my husband (the baker in the house) make it for us. I thought it was delicious, but he wasn’t as impressed as I was. When he was also going to make some “normal” banana bread for the office, I insisted he make this one because I was sure people would like it, even though he was skeptical. Turned out they went wild over it, with one person even stealing a piece from another who had set it aside for the next day. Needless to say, it was a huge hit, so my husband — now a believer in lavender banana bread — is making it to bring to a friend’s house for Easter!